Nestled along the shoreline of the historic Dubai Creek, Culture Village is set to become one of Dubai’s most celebrated districts where classic elegance and modern ambiance amalgamate. It will be replete with art exhibitions and cultural centers that best showcase the fascinating rich history and culture of the city. Culture Village is a magnificent residential, commercial, and retail district that will offer a serene, contemporary lifestyle. The upcoming luxurious mid-rise developments that will inhabit its highly coveted residential district will effortlessly blend contemporary designs with the exquisiteness of traditional cobble stone walkways, creek-side souks, and charming waterways. Academies for art and music, cultural institutions, and reputed schools will occupy its commercial district, while its retail district will be home to luxury hotels, craft galleries, and a diversity of culinary and retail venues. Life in Culture Village is as enchanting as its waterfront environment. Residents and visitors alike can experience a vibrant lifestyle, while relishing the magnificence of its luxuriant backdrops. With the endless variety of choices for leisure and entertainment, individuals and families can enjoy a wonderful evening of fine dining with friends and loved ones, or a leisurely stroll along the fascinating creek. The surrounding glistening lights and spectacular views of Dubai’s iconic skyline are a treat to the senses, creating a calming and relaxing sensation. Located at the tip of Culture Village, Jameel Arts Centre is a highly anticipated new development expected to open in the winter of 2018. It is a three-storey multi-disciplinary space designed by Serie Architects, set to serve as a center for research and educational initiatives. Art Jameel, a non-profit education, arts, and heritage organization initiated the conception of this innovative art center. Standing gracefully right in the heart of Culture Village is Palazzo Versace Dubai, an opulent hotel and resort development famed for its exceptional sophistication and grandeur. Designed in collaboration with Donatella Versace, it is a true embodiment of the extraordinary refinement of the world-renowned Versace brand. 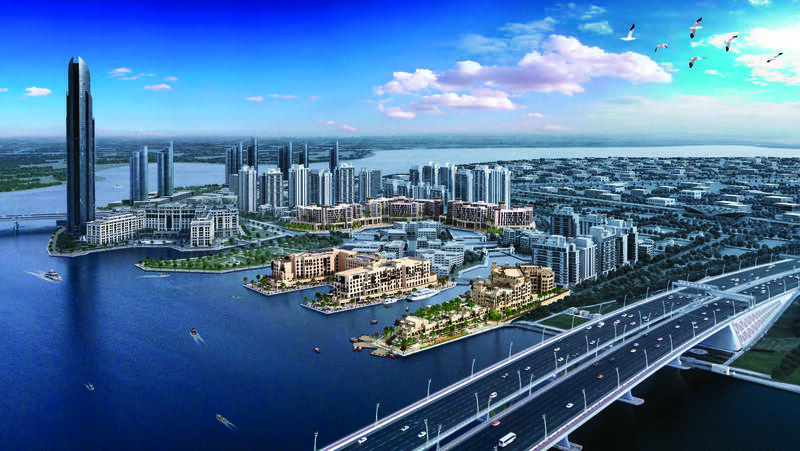 Dubai Wharf is a forthcoming mixed-use development in Culture Village that will offer a relaxed living experience. Its inimitable design is a contemporary take on a traditional Arab town. Developed by Dubai Properties, it will feature a mix of dining and retail offerings and an exclusive collection of luxury homes of varying architectural styles overlooking a charming canal promenade.